Amazon.com description: Product Description: Soon enough, nobody will remember life before the Internet. What does this unavoidable fact mean? For future generations, it won't mean anything very obvious. They will be so immersed in online life that questions about the Internet's basic purpose or meaning will vanish. But those of us who have lived both with and without the crowded connectivity of online life have a rare opportunity. We can still recognize the difference between Before and After. We catch ourselves idly reaching for our phones at the bus stop. Or we notice how, mid-conversation, a fumbling friend dives into the perfect recall of Google. 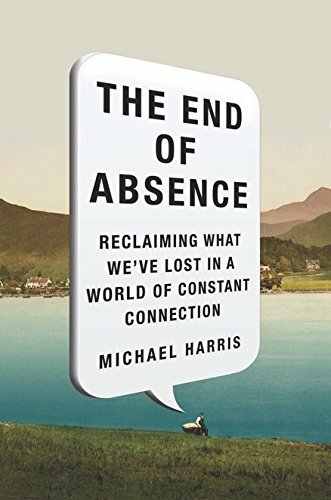 In this eloquent and thought-provoking book, Michael Harris argues that amid all the changes we're experiencing, the most interesting is the one that future generations will find hardest to grasp. That is the end of absence-the loss of lack. The daydreaming silences in our lives are filled; the burning solitudes are extinguished. There's no true "free time" when you carry a smartphone. Today's rarest commodity is the chance to be alone with your own thoughts. About: Soon enough, nobody will remember life before the Internet.